The Emoji 12.0 list for 2019 has been finalized. Now all that is left is for Apple to add them in a software update. When will you get them? How are new emojis made? Emojis are defined by a group called the Unicode Consortium, comprised of representatives from a number of hardware and software companies. They agree on updates to the Unicode Standard, which is a common means of encoding and representing text in digital formats. It's the foundation of transmitting and displaying text on nearly all modern digital platforms. Emojis are a part of the Unicode standard, and the group gets together each year to decide which new icons will be added to the official list. On February 5, Unicode announced that the Emoji 12.0 list has been finalized and is ready for implementation. The new Emoji 12.0 standard includes 59 new emojis. There are new foods, like waffle and butter. You'll find new animals, like the flamingo and sloth. As always, the group has added quite a few new objects and shapes, from new colors to existing shapes (such as a white heart and several new colors for squares and circles) to objects like a sari, a diya lamp, or a banjo. 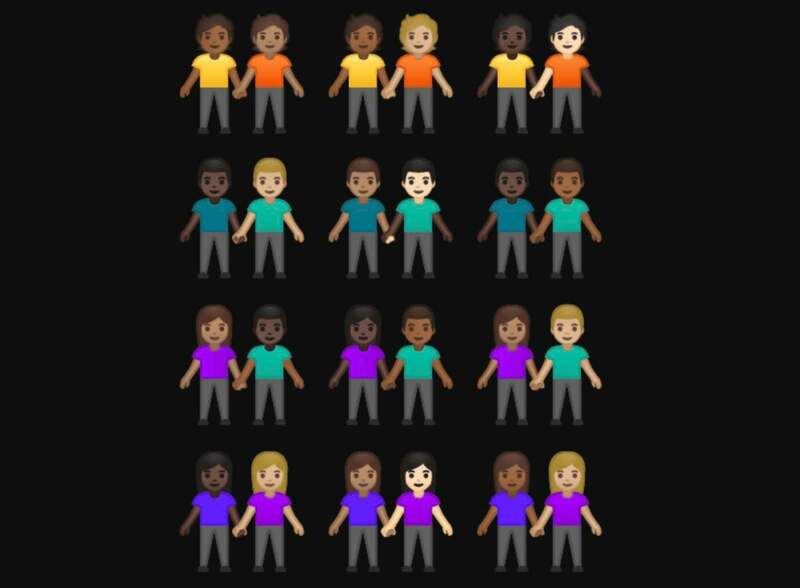 Many of the 230 emojis are variants on people holding hands, representing different gender and skin tone combinations. But if there's an overall theme to the Emoji 12.0 list, it's greater inclusion and representation. Those 59 new emojis become 230 when you consider the 171 variants to account for gender and skin tone. Many of them account for combinations of two people holding hands, including two men, two women, and two gender-neutral people (to represent non-binary people, or to use when the gender is unknown or unspecified). These all come in a variety of skin tone combinations. All of Apple's proposed accessibility emojis have been included in the 12.0 standard. 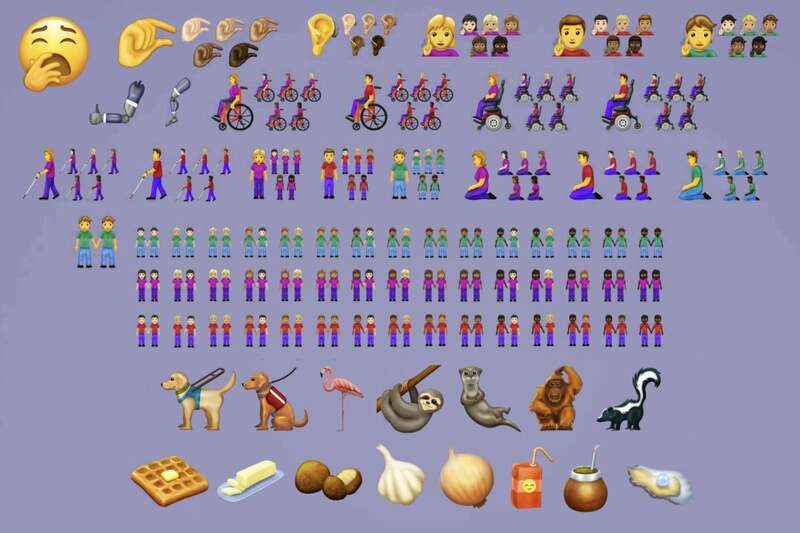 People with disabilities are far better represented in the new emojis, too. 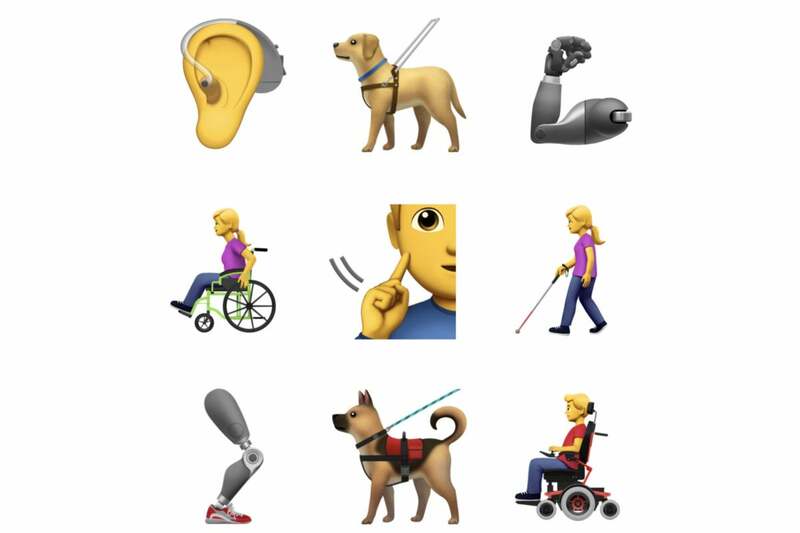 The consortium has agreed to include all nine of Apple's proposed accessibility emojis, including people in wheelchairs, ears with hearing aids, deaf people, guide dogs, people with canes, and mechanical arms and legs. Once the new Emoji list is ratified and released, it is up to software makers (typically those that make operating systems) to implement them. There are specific guidelines about what each icon should include, but the artwork itself is otherwise not standardized. Apple, Microsoft, Samsung, and Google all have their own emoji art. Apple is generally pretty quick to implement new emojis, and they can come from either major or minor iOS and macOS updates. There were more than 70 new emojis in iOS 12.1, for example. We haven't seen any of these new emojis in the iOS 12.2 beta, and don't yet know if they will come in an iOS 12 update or this fall with iOS 13. Some software makers, like Twitter and Facebook, create their own emojis for use on the web and inside their apps on certain platforms (though iOS apps generally use Apple's emojis). So you may see some of the new emojis on the web before Apple includes them in an iOS or macOS update.